We’d love your help. Let us know what’s wrong with this preview of Word Nerds by Brenda J. Overturf. 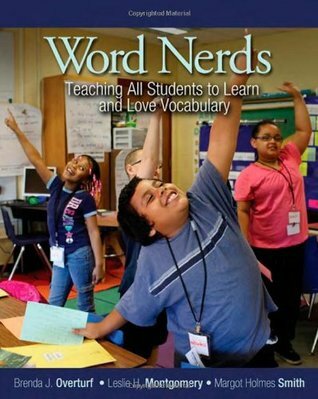 Word Nerds takes you inside classrooms at a high-poverty urban school and shows how two teachers implement creative, flexible vocabulary instruction that improves their students' word knowledge and confidence, enhances classroom community, and increases achievement. Leslie Montgomery and Margot Holmes Smith weave vocabulary into each school day using multisensory instructi Word Nerds takes you inside classrooms at a high-poverty urban school and shows how two teachers implement creative, flexible vocabulary instruction that improves their students' word knowledge and confidence, enhances classroom community, and increases achievement. Leslie Montgomery and Margot Holmes Smith weave vocabulary into each school day using multisensory instruction that includes music, art, literature, movement, games, drama, writing, test-taking skills, and technology. Along the way, they turn every student into a lover of language. With support from literacy specialist Brenda Overturf, Leslie and Margot have developed a five-part plan—introducing new words in context, adding related synonyms and antonyms, engaging students in several days of active learning, celebrating new words, and assessing vocabulary development—that teaches all students to learn and love vocabulary. To ask other readers questions about Word Nerds, please sign up. Is this book good for working with ESL students? Now this is an AWESOME book about strategic vocabulary instruction. Not only does it offer strategies for teaching vocabulary, but it also gives you a 5 day plan and 10 day plan that you could follow if you wanted. Another practical PD book that I'm in love with. A fantastic book that covers both the research behind the need for vocabulary instruction as well as a plan for implementing daily rich vocabulary instruction in the classroom. I really enjoyed this book. It had a lot of good strategies, routines, and games to practice vocabulary with your students. I liked that the authors separated primary and intermediate activities sometimes, as it can be hard to see how an activity that works in 3rd grade will work in a 5th grade classroom. While definitely geared towards teachers in high poverty schools, it is accessible and relevant to all elementary teachers. Low vocabulary is tied to low-income families. Hart and Risley wrote about a "30-million word gap between professional families and economically disadvantaged families." This book takes vocabulary instruction to a new level by introducing words, practicing words, and making link between words highlighting synonyms, antonyms, morphology, examples, and non examples. They also use an interesting cloze evaluation tool similar to the MAZE in Dibels. This is a really great resource for vocabulary instruction. I felt like chapter 5 was the most useful. Some of the book was a lot of background teacher stories. I wouldn't have minded the information to be a little more direct, therefore shortening the book a bit. I bought the Kindle edition because it was much less than the paper book, but there are a lot of reproducibles that would be good to be able to copy. I enjoyed this book as it offers many ideas for implementing vocabulary learning that is student centered and not driven by a core program. It's an easy read and weaves current and past research throughout. There are many vignettes from the classroom which starts to bog the book down. Overall, a good resource that I will refer back to. This book has a lot of great ideas and information to help make vocabulary instruction much stronger in the classroom. I am excited to try some of these ideas in my classroom. I believe they will help the students with retention of vocabulary words as well understanding the definition and use of the word. This book is very motivating to try new things with teaching vocabulary. But. The ideas are VERY teacher intensive. VERY. I thought after the first round it would get easier. Nope. I was working harder than my students. On to try something else! Lots of really practical vocabulary activities. I especially appreciate the opening that discusses and frames the book around research of vocabulary instruction. Nicely done. Full of great ideas to implement vocabulary! I absolutely loved this book. 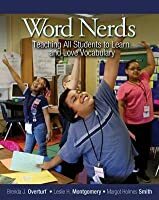 Easy to follow suggestions and guidelines for helping turn your students into "word nerds" too. This is definitely a book that will live on my desk at school.